Building the Cycling City is authored by a Canadian couple, who decided to give up their car as a lifestyle experiment. They and their young children became so invested in the new lifestyle that they spent 5 weeks cycling around the Netherlands, and came home eager to document what they had seen. They call the Netherlands “the world’s foremost cycling nation”, and the only one to have more bikes than people (page 1). Cycling is apparently so embedded in the Dutch culture that the language has two words for cyclist: wielrenner (“wheel runner”, or serious sport cyclists, a minority) and fietster (the majority). Building the Cycling City posits that the intensity of Dutch cycling isn’t related to cultural or geographical factors, but political ones: extensive bike lanes, separated from cars, and traffic-calmed streets with low speed limits. The benefits of the political decision to invest in cycling are numerous, including quality of life, health, environment, cost savings (fewer traffic accidents and emergency callouts) and even driving experiences (as people aren’t required or pressured to drive, and can have pleasant associations with it). 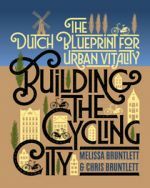 The book delves into the history of planning in Dutch cities, such as the overhaul that followed Rotterdam’s bombing during World War II, to show that the Netherlands’ cycling-friendliness isn’t just an accident. Yet the authors stress that other locations can’t simply copy the Dutch methods. Obviously planners can’t wait for city centres to be levelled during wartime in order to build back better, for instance. So the book also draws comparisons between Dutch cities and North American ones, some of which have explicitly drawn on the Netherlands for inspiration. In Austin, Texas, for instance, cycling advocates have had to build both a cultural and economic case for cycling infrastructure, in a state where the car is king. Building the Cycling City is almost unflaggingly optimistic, for instance in its vision of cargo bikes for goods delivery and family transport (although there may be an uglier side to these cargo bikes as a symbol of gentrification). The book also lauds the Dutch system of bike education, for socializing both children and migrants into the Dutch way—although this may not grapple with cultural issues that affect migrants’ propensity to cycle, for instance. Written by cycling enthusiasts, not academics, Building the Cycling City is an accessible read. Newman, Peter (1996), “Reducing automobile dependence”, Environment and Urbanization Vol 8, No 1, pages 67–92, available at http://journals.sagepub.com/doi/pdf/10.1177/095624789600800112. Pucher, John and Ralph Buehler (2017), “Cycling towards a more sustainable transport future”, Transport Reviews Vol 37, No 6, pages 689–694, available at https://www.tandfonline.com/doi/full/10.1080/01441647.2017.1340234.